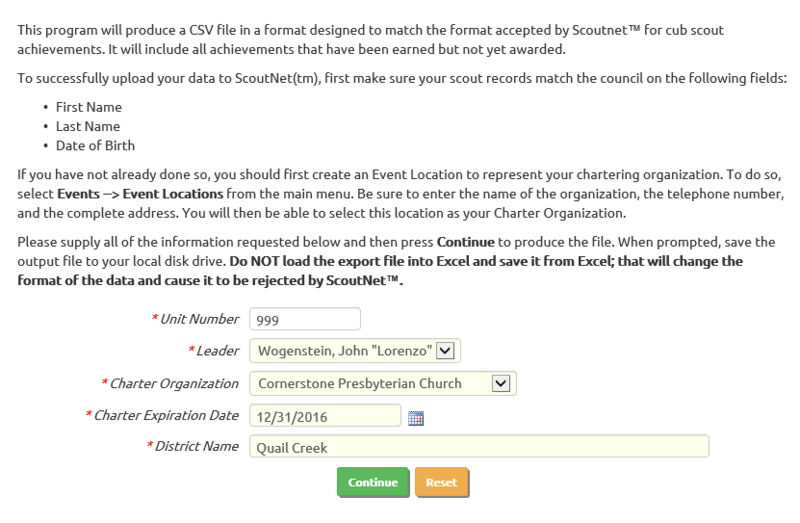 Many councils encourage their cub scout packs to submit their advancement data electronically using the ScoutNet™ interface. ScoutNet™ allows you to upload a CSV file containing this data. You can create this fil by selecting Export Cub Scout Achievements from the Cub Scouts menu. This function will export all adventures, badges and awards that have been earned but not yet marked as awarded. Before using this function, make sure you have an Event Location that represents your charter organization. This is where we will pull the name and address of your charter organization. Supply all of the requested values on this page, then click the Continue button to produce the file. Your browser will prompt you to open or save the file. DO NOT OPEN THE FILE IN EXCEL! Excel will change the format of the data in a way that will cause it to be rejected by ScoutNet. Instead use your browser's "Save As" option to save the file directly to your local disk drive. From there you can upload it to your council's site.